Screenie is the first plugin using kuio module for SD access. taiHen plugin that allows to take screenshots without Sony compression in whatever moment you want, in any game and without watermark. - Install Screenie.suprx under whatever game you want or unde r*ALL in your config.txt. Wow thank you for this amazing plugin, I'll test it asap! Something i forgot to mention, due to little buffer used by kuio, taking a screenshot can take several seconds so don't worry if it seems to be freezed. A very useful plugin, thank you, I never liked the JPEG compression of PSVita official screenshot feature. Last edited by RedSquirrel on Sat Apr 29, 2017 6:09 pm, edited 1 time in total. 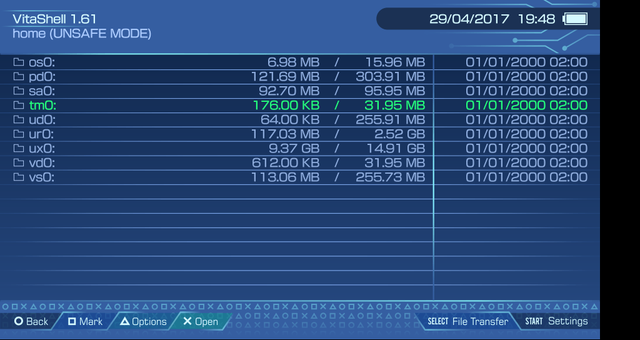 RedSquirrel wrote: A very useful plugin, thank you, I never liked the JPG compression of PSVita official screenshot feature. Probably PS4 Remote Play works like Livearea, it would require to access the shared framebuffer in sceAppMgr. As for the black band, it's caused by differences between real width and framebuffer pitch (960x544 mode uses a 1024x544 framebuffer). Sadly, there are games that do have centered framebuffer so i can't just remove the black band assuming it's on the right side of the framebuffer. - Fixed a bug causing screenshots to be taken with an incorrect pixels line on bottom part of the screenshot. - Now the black band at the right side of the screenshots won't appear anymore. - Now screenshots taking is a bit faster. Why not completely replace the in-built screenshot function with this plugin? DPyro wrote: Why not completely replace the in-built screenshot function with this plugin? Cause it would require reversing screenshots functionality. SceScreenshot doesn't have a callback function or some sort of helpful functionality to do so. Wow, great work. Thanks a lot for this and all great homebrews/plugins you shared with us.